For affordable apartments in Las Vegas, Mesquite, Reno, Albuquerque, Phoenix, San Antonio & Shreveport, you can’t beat Siegel Suites. We offer apartments with cheap rents by the week* or month and your choice of a fully furnished or unfurnished apartment. You can also rent a studio apartment, a Jr. 1-bedroom apartment, a large 1-bedroom apartment, or a large 2-bedroom apartment – whatever size apartment you need! Looking for a dog-friendly apartment? That’s no problem either. All our Las Vegas apartments are pet-friendly. And with Siegel Suites you get more than just an affordable apartment. All our rental apartments come with free premium cable TV, free utilities, laundry facilities, and other extras. All are also available furnished so they are move-in ready, and all our apartments have full kitchens too. Siegel Suites is also great short-term apartment choice because all our apartments have weekly* rates, no long term lease to sign, and bad credit is ok before you start renting. But don’t be surprised if you feel like staying for months, for years – or forever! 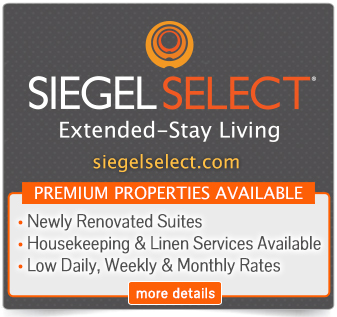 Call us at 1-888-328-0192 to rent your Siegel Suites apartment today!